The pound was bid on Wednesday and rose to fresh two month highs amid higher inflation numbers. The GBPUSD pair was seen 0.40% stronger during the London session and was changing hands near the 1.32 level. The headline CPI inflation in the United Kingdom rose from 2.5% to 2.7% for the month of August, which was above 2.4% seen by analysts. Monthly change soared from 0.0% to 0.7%. The core inflation improved as well and jumped to 2.1% to 1.9%, while economists had expected a slight slowdown to 1.8%. Other inflation indices also accelerated, which sent sterling sharply higher in the initial reaction. Later in the session, the US building permits, along with housing starts will be released, along with current account for the second quarter. However, the overall sentiment appears anti-dollar and therefore the current bullish wave might continue throughout the day. The price surged to the upper line of the current rising wedge pattern, which is a bearish reversal pattern. Moreover, the 1.3200 resistance stands at previous swing highs and therefore bigger selling offers have been located here. 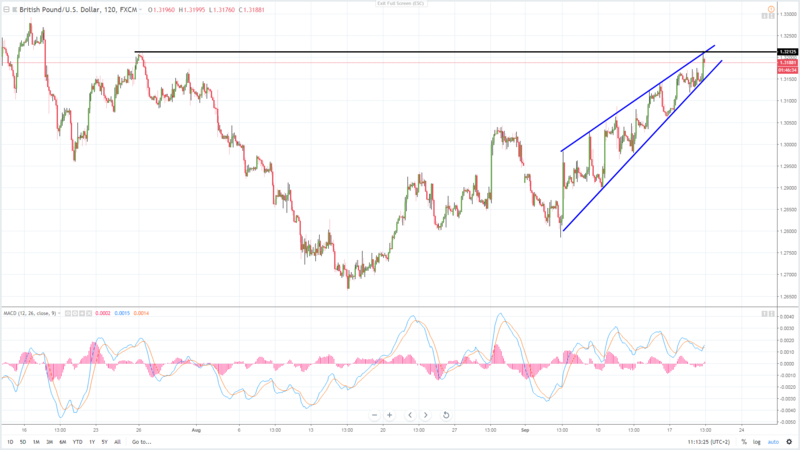 Should the pound jump back above 1.3215, the trend could switch to bullish. However, should cable decline below 1.3150, the wedge pattern could come into play, suggesting further weakness toward 1.3060.